I have interview lots of people (Erykah Badu,Beyonce,Marc Jacobs,etc) but my greatest interview had to be the one I did with Jay Lawrence Friedheim ( Man on the right). I actually never planned to interview him. I posted something about Huey in My Swag Magazine (09) and he reached out to me. Me, I was so in shock that somebody that got to meet the man and spend hours with the man reached out to me. That had to be the greatest day in history for me. Well, in the history of me living. This is Jay's back story on the photo. This seems like a great way to end black history month. This picture I took in Huey’s bedroom by setting up the camera and having a timed flash. Huey’s home in the Oakland hills was given to him by the Actor Rod Steiger. I was Bob Trivers assistant for a couple of years while I was working my way through college at University of California Santa Cruz studying Biology. I worked extensively with Bob and Huey on the Deceit and Self Deception work. There were plans for a book. We used to get together and talk for hours on the subjects, plan areas of research and then I did a lot of library work as the world was not yet blessed with search engines. We also had a fondness for having really good times together. Huey did the political analysis , Bob do the biological work and animal behaviors, cryptic coloration's and I gathered everything that was known to that time about deceit and self deception in human beings. For example I gathered all the work on lie detection, ocular stability and the use of placebos in medicine. I had become friends with Huey before Bob arrived at UCSC because we had of a couple of mutual friends of ours in common such as , Lucy Montgomery and Fred Hampton in Chicago. I was very close with Lucy and she was a major figure in the political activities in Chicago of those days. I would often be and her home when Jesse Jackson would drop buy for lunch or just to hang out. I met Jane Fonda, Studs Turkel at her home and countless people in the acts and politics. Here is a bit I found about that. 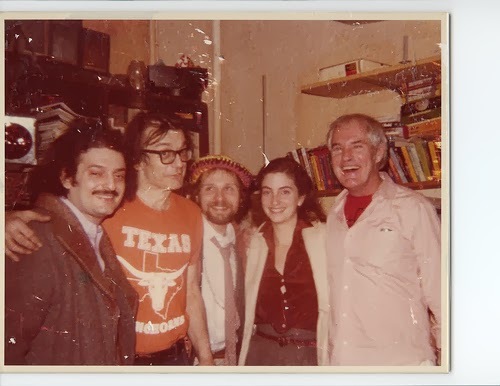 When I left Santa Cruz I went back to Chicago and became good friends with Del Close the then Director of Second City and the Acting coach for Saturday Night Live, who in his own way had the same kind of creative genius that Bob and Huey demonstrated in their own field. Bob and Del became good friend when he would come to Chicago and I was living with Del . Here is a picture of Del and I and some friends in our apartment in Old Town in Chicago. This was the night I introduced Tim Leary to Del because Tim was debating G. Gordon Liddy and Liddy was destroying him in stage. Del got him up to speed in no time.